The 48' Fife 'Kismet' was pulled from the Essex mud where she's been for more than 50 years. 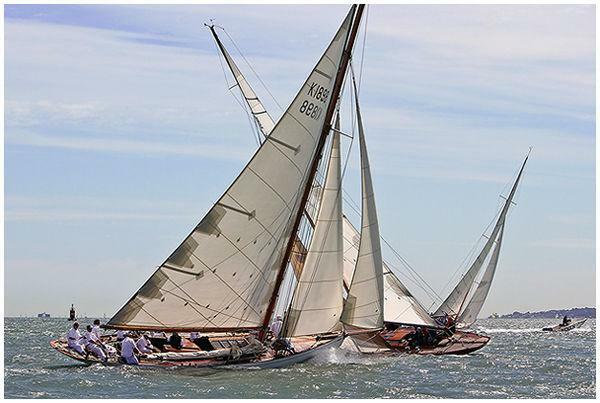 She was bought by Richard Matthews, owner of Oyster Marine and Southampton Yacht Services(SYS) and then put into the hands of boatbuilder Adrian Wombwell who also restored the Fife, Pierrette. Having last sailing in 1949 she needed to undergo a complete restoration in time to be launched in 2008. Collars became involved early on in the project and rig design, and supplied all the spars fully varnished and dressed ready for rigging and stepping at Foxes Marina, Ipswich. Having competed in a number of regattas in home waters she has also ventured down to the Med where she sails under CIM.